"When New York buffs get to reminiscing, they are likely to recall that most embarrassing of days when, fate of fates, the Third Alarm Association’s headquarters in the Bronx burned. But it’s an ill wind that doesn’t blow someone some good, as the cliche goes, and this particular wind played a role in bringing a group of energetic young buffs on Staten Island to the fore. When the TAA relocated in Manhattan, there was need for someone to provide canteen service on Staten Island. A group with a name as big as its ambition volunteered—the Richmond Association of Auxiliary Firemen-8-8 Fire Buff Club. At that time, circa I960, the Staten Island buffs club was only two years old. And if it’s any source of pride to the many young buffs who write this column in search of encouragement, the Staten Island club was formed by a 15-year-old. On January 24, 1961, the Staten Islanders entered into an agreement with the American Red Cross and the New York Fire Department. The pact called for the club to provide canteen service on Staten Island (or Richmond as the natives know it) 24 hours a day. The Staten Island Chapter of the Red Cross funded the operation and provided the equipment. In 1964, the club became The Signal 8-8 Fire Buff Club, Inc. But Staten Island wasn’t big enough to contain these enthusiasts and they have ranged fairly far in pursuit of the smoke spoor. When the worst fire in Staten Island’s history (April 20, 1963) destroyed more than 100 homes, 16 members and their wives worked with firemen, helped to evacuate citizens, and assisted at Red Cross shelters. What started out as an enthusiastic group of buffs in their teens, has become a club whose members now wear the FDNY blue, or serve in other fire service capacities. President John Jansen is with the Fire Patrol of the New York Board of Fire Underwriters; Vice President Roy N. Johnson is a fire alarm dispatcher in Manhattan; and Kryger, the club’s founder, is secretary. Membership totals 23 and the outfit runs out of Room 100, 36 Richmond Torrace, Staten Island, N. Y. 10301. Their phone number, in case you’re in New York is YU 1-8951." Note - The "YU" in phone number was for "Yukon"
There has also been a 6-6 Fire Buff Club mentioned in this site. I don't know if there has been any buff club associated with the Bronx. "TO BUFFS EVERYWHERE, New York City is without peer as the capital of buffdom. It’s a city of spectacularly big blazes and of disastrous fires: The Triangle Shirt Waist Co. fire; the famous Wooster Street blaze; and that fireman’s nightmare which regularly plagues the New York Fire Department—Hell’s Hundred Acres in lower Manhattan. It’s a city of unusual fires: The recent Grand Central subway blaze; the highin-the-sky fire when an airplane crashed into the Empire State Building. It’s a city where some of the most rugged waterfront fire fighting is practiced: The SS Normandy blaze, the aircraft carrier Constellation disaster. It’s a place where airliners collide over the city and come crashing down to set a five-alarm fire in a church and another multiple-alarm fire several blocks away. It’s a city where one battalion chief gets so much action that a second battalion chief is moved into BC’s quarters to alternate with him on handling the alarms when the going gets rough. It’s a city where buffs are as knowledgable about the complex procedure of fire alarm communications in that peculiar jargon of simultaneous borough calls and Signal 7-5 “holding all companies” and radioed reports from Car 5 (the fire chief) that he’s “doubtful will hold,” that many buffs concentrate on listening to the action on their radios and over alarm and telegraph registers. The fire isn’t nearly as interesting to them as the chess game that the dispatchers “on the platform” play in juggling equipment and manpower of the world’s largest fire department. New York is a City where there are more buffs per square mile than any place on earth. It’s a city where the buffs get to fires faster (usually by subway) than almost any city anywhere. It’s a place where buffs cannot lay claim to the title until they have seen a simultaneous borough-call blaze before they go off to buff Valhalla and, hopefully, return reincarnated as a New York City fire buff. Amid this plethora of firemanics, buffdom in New York City also lays claim to having more organized clubs than anywhere else—five of them in the various boroughs. And, if you count the environs where there is always plenty of fire fighting, too, three more of them. All of which makes a total of eight clubs in the Greater New York area. In this and future columns, well visit, if only vicariously, these clubs and look at some ot the worthwhile community service performed by them as the New York Fire Department celebrates the centennial of its organization. The city’s two best-known clubs are The Fire Bell Club of New York and the Third Alarm Association. Brooklyn, which can usually stand alone as an action-packed place for fire action, has the energetic 255 Fire Club, Inc. Staten Island has its eager-to-serve Signal 8-8. And, of course, there is the wellknown Association of Auxiliary Firemen of Manhattan, Inc.
Small wonder, then, that the International Fire Buff Associates decided to hold their 1965 midwinter board meeting in New York not long ago. The Third Alarm Association (TAA) was host club for the meeting and provided a program of scheduled events and some unscheduled events—but nonetheless predictable. In the latter category, the buffs turned out to a five-alarmer in a foam rubber factory in Flushing, Queens, on a Friday night. And just to prove that the unusual can be counted upon to happen in New York, consider what happened to the city’s new fire chief, John T. O’Hagan. It’s something that will go down in his and the buffs’ record books. The first multiple that Chief O’Hagan took in was a Saturday noontime blaze in a bowling alley near Broadway and 218th Street in Manhattan. They stopped it with second-alarm response. But not for long, because a firebug was not sated with a mere deuce. The following evening, an alarm was again turned in for the bowling alley. Before Car 5 declared the fire under control, the affair had gone into a fourth alarm. Twenty-two TAA’ers responded with the American Red Cross canteen and operated at the scene for five hours. When not counting the register taps, buffs are likely to be poring over the official FDNY magazine, “WNYF” which is one of the finest publications of its kind. With New York Firemen” is popular with buffs all across the nation who subscribe to it for $2.00 by the calendar year. Subscriptions should be sent to Samuel Black, Subscription Department, WNFY, Room 1104, Municipal Building, New York, N. Y. 10007. The magazine is celebrating the centennial itself with special commemorative issues. Or, if you want a quick eyeball-to-eyeball rundown on what happened in the FDNY last year, send a big envelope—and we mean a big envelope— with about 15 cents postage affixed to it to Ira Hoffman, GPO Box 19, Brooklyn, N. Y. 11202. Ira tells me that he has a limited supply of the complete list of runs and workers for the FDNY during 1964. Until the next simultaneous borough call, please send your anecdotes and club reports to me. There’s a new address— P. O. Box 66337, Los Angeles, Calif. 90066. Regretfully, letters cannot be answered other than in this column." My great uncle was very active in the 255 Club as well as the Auxiliary Fire Corps. The older guys on this site know that Manhattan and The Bronx boxes both the the prefix of 6-6 and that Brooklyn and Queens had the prefix of 7-7. The reason why is that all Manhattan boxes ended before Box 2000 and the Bronx boxes started at 2100. The Brooklyn and Queens prefix worked because the Brooklyn boxes ended at 3999 and the Queens Boxes started at 4000, This was during the time when that Bells were still in operation,this would not work today as you know there are 4000 boxes in both Queens and Bklyn.I hope you will understand what I'm trying to say here LOL. and old expression "you had to be there to see it or understand it"
Richmond (Staten Island) boxes had the prefix 8-8. I'm not positive about this and if anyone cares to correct me please feel free to do so. I believe that the highest box number in Manhattan (in the early 1960s, at least) was 1868 at Henry Hudson Parkway, 300 feet south of Dyckman Street Entrance. There were unassigned box numbers from 1870 through 1899. Engine 95/Ladder 36 firehouse 29 Vermilyea Avenue Inwood, Manhattan Division 7, Battalion 13 "The End of the Line"
As can be seen in the early photos, the firehouse was lettered for Engine 95 and Ladder 50. Ladder 36 was originally organized with Engine 43. In 1913 Engine 43 and Ladder 36 became a combination company numbered 43. In 1915, Combination 43 reverted to Engine 43 only, so number 36 was available for reassignment when Ladder 50 came up. Ladder 36 was organized while Ladder 50 was later used for a new Ladder Company at Engine 89 in 1926. 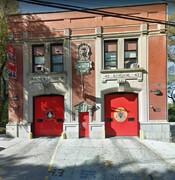 The land engine quarters of Engine 43 (which Mack has not profiled yet) has been home to three different Ladder companies. Prior to that, Engine 43 was the first Fireboat (Marine Company), "William F Havermeyer"
Ladder 36 was organized there, then disbanded when Engine 43 became a Combination company. TCU 712 was stored at Engine 43 when off duty. In reply #426 Manhattan stated that the last Box# in Manhattan was 18something that is in the parameters of up to 2000. I'm quite sure Chief JK knows that I'm correct in the way I explained it. In August of 1874, the Commission­ers contracted with Wood Dialogue & Company, Philadelphia, for the con­struction of a fireboat at contract price of $23,800. When placed in service on May 12, 1875, the boat, which had been named the WILLIAM F. HAVE­MEYER, was berthed at the foot of Pike Street. 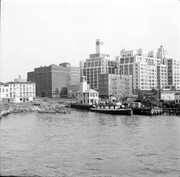 East River, and Engine Company 43 was organized to man her, with two officers, two engineers, pilot and five firemen. 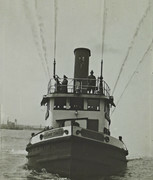 The HAVE­MEYER was a wood hull vessel and, like several of the early fireboats, had quarters aboard for the crew. In fact, these boats were moved from one lo­cation to another without any more preparation than running the fire alarm telegraph wires to provide a ship-to-shore connection. Until the time that John Kenlon became Chief of Department, the company number remained with a fireboat regardless of its location. Not least important in the Fire Department of New York city is the harbor fire-boat William F. Havemeyer, or, as she is officially known, Engine No. 43, N.Y.F.D. This fire-boat is a powerful steam-tug of 110 tons burden, and was built in 1875 by Wood & Dialogue, of Camden, New Jersey, by order of Fire Commissioners Perley, Van Cott, and Hatch. She is propelled by a low-pressure engine of 300 horse-power, and is one of the swiftest tugs in the harbor. She has made the distance from her berth - Pier 1, North River, close beside Castle Garden-to the foot of West Twelfth Street in twelve minutes. For fire apparatus the Havemeyer is provided with two powerful Amoskeag pumps, capable of throwing 2000 gallons of water per minute. This immense volume of water can be thrown through ten separate lines of hose, or connected in one, from which it discharges with force sufficient to overthrow brick walls or tear down a substantial building. An amusing incident in the career of the fire-boat happened a few years ago, upon her return from a short excursion down the bay, with a party of Western chief engineers of fire departments on board. An elevator in Brooklyn was on fire, and several tub-boats were throwing streams of water upon it. As the Havemeyer approached, with a view of rendering assistance, and at the same time showing the Western visitors of what she was capable, the tugs directed the several streams against her for the purpose of driving her off. Instead, however, of leaving she turned two of her powerful streams upon them, and within five minutes had the field to herself having completely deluged her opponents. She then went to work and subdued the fire, to the great admiration of her guests. Her equipment includes nearly 5000 feet of the best rubber hose of which is three inches in diameter, the largest ever made, and a large assortment of nozzles, among which is a "Siamese," or double nozzle, and a "double Siamese," or quadruple nozzle. She is connected with the regular fire alarm of the city by a cable, which can be detached at an instant's notice, and with the several engine-houses by telephone. Her fires are never allowed to go out, and a constant head of fifty pounds of steam is maintained in her boilers. She is always clear of her berth within a minute after receiving an alarm, ad has been cleared and got under way in thirty seconds. The crew of fourteen men is commanded by Captain R.R. Farrell, who ranks with the foreman of a land company, and Lieutenant W.C. Braisted, who ranks as assistant foreman. There are also two pilots, two engineers, three stokers, and five men who act as deck hands, or, at a fire, as firemen. The duty is arduous, for all hands must sleep on board, and though they may take their meals at their homes, no more than two men are allowed to leave the boat at a time, and at fires the work is incessant and more prolonged than that of land companies. The reasons of this prolonged duty is that the Havemeyer uses salt-water, she is employed to drench out fires that come within her reach, in order that Croton may not be wasted. Thus, during the holiday season last winter, she was stationed for ten days opposite the United States Storage Warehouse fire on South Street, during all of which time she kept a steady stream playing upon the smouldering ruins. The fire-boat is expected to answer all calls along the water-front of either river within the city limits, and upon her arrival at the scene of a fire her Captain reports to the Chief of Battalion in charge, and receives orders from him the same as a foreman of a land company. In addition to this duty, the fire-boat must be ready at all times to go to the assistance of any vessels getting on fire in the harbor, and, if necessary, must tow all vessels in dangerous proximity to the burning one to a place of safety, or tow away the burning vessel itself. On special occasions she has responded to calls beyond the city limits, once going as far as Tarrytown, and once, when Hoboken firemen were on a strike, rendering valuable assistance in subduing a fire that broke out on the Eagle-Steamship Company's pier, and saving much property. It is estimated that the Havemeyer has saved from destruction property worth more than her weight in gold, and realizing her importance, and also her inability to all calls made upon her along our constantly increasing line of water-front, the Fire Commissioners have ordered another fire-boat to be built. This new boat, now in the process of construction, will be considerably larger than the Havemeyer. The crew of the present fire-boat are an active, well-trained lot of men, who take great pride in their craft, and spend their spare time in burnishing her brass fittings, painting her wood-work, or in otherwise beautifying her. They have also on occasions exhibited great personal bravery, not only at fires, but while lying quietly at Pier 1. There is not one of them who is not ready to spring overboard in answer to a cry of distress, and several persons who have fallen or been thrown into the water in this vicinity owe their lives to the brave crew of the fire-boat Havemeyer. On May 18, 1895, the New York Times reported on a confrontation between the Havemeyer and the Restless, a tugboat chartered to the city's Sanitation Department. A fire had broken out at the Sanitation Department's "dumping wharf". 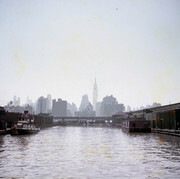 The wharf, a large wooden wharf near 46th Street was used to load barges with the city's garbage. Tugboats, like the Restless, would then tow the barges out to sea, where it was dumped. A colony of homeless men the New York Times called "wharf rats", lived in spaces within the wharf, where they supported themselves by salvaging bottles, rags, and other refuse that had resale value.The New York Times blamed the fire on cooking fires the homeless men used to cook their breakfasts. When the Havemeyer arrived at the wharf it found that the Restless was already fighting the fire with its less powerful pumps. When the Restless refused to get out of the way the Havemeyer turned its pumps on it. The New York Times reported that the smaller vessel was at risk of being swamped. The conflict between the two vessels consumed fifteen minutes, only ending when a senior fire department official convinced a senior Sanitation Department official to order the Restless to get out of the way. 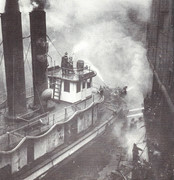 The fire was eventually extinguished when The New Yorker came to assist the Havemeyer. Thrown from tender while responding to a fire. Engineer of Steamer John Bulger was assigned to FDNY Engine Company 43, the fireboat William F. Havemeyer. No information on his death could be found except for a telephone message from Foreman Cooney of Engine 29 to Doctor Johnson in the dispatcher’s logbook. Engineer of Steamer Bulger was detailed to Engine 29 probably to relieve the Engineer of Engine 29 for a meal break. Engines 29 and 43 were located close to each other. The fire was at 194 Broadway in a five-story brownstone measuring twenty-five feet by one hundred feet. Damage to building and contents was slight. - from "Find a Grave"
Engine 43/Ladder 59 firehouse University Heights, Bronx Division 7, Battalion 17 "Best in the West" "Sedgwick Slashers"
Capt. Richard Jacquin was awarded the James Gordon Bennett Medal for bravery and rescues performed at Box 5-5-2935, 1748-54 Jerome Avenue, August 21, 1988 at the "El Hoyo Social Club fire". The El Hoyo Social Club was an illegal cellar social club on the corner of 175th Street. Capt. Jacquin, working overtime in Ladder 27, responded as the second-due truck. Capt. Jacquin, Fr. Fennell and Fr. Forsyth went towards the entrance to Joe’s Auto Repair shop. There were several civilians frantically trying to raise the roll down gate of the repair shop. The civilian’s efforts jammed the roll down gate. It was stuck and it was only raised 2 feet above the floor. Heavy smoke was coming out of the gate. Captain Jacquin deployed his search rope and he, Fr. Fennell and Fr. Forsyth entered the auto repair shop. The smoke condition was heavy and fire was raging in the cockloft. They made their way toward the rear of the shop. They came upon two large dogs that had succumbed to the smoke. As they made their way deeper into the shop, they found an open stairway. High heat was coming out of the stairway. They descended the stairway, into the rising heat. Half way down the stairway, they found an unconscious man. Captain Jacquin removed him to the outside of the building where he was turned over to EMS personnel that started CPR. Ladder 27’s forcible entry team continued their search for trapped occupants. Captain Jacquin re-entered the cellar where he found Fr. Dennis Fennell with an unconscious female. He helped Fr. Fennell carry the victim up the stairs and over the obstacles deep in the auto repair shop to the street and they began resuscitation on the female victim. Fireman Charles E. Parks was killed when he was thrown from the hose wagon while responding to an alarm at 1:40 in the morning. This was not the first time that Fireman Parks was thrown from apparatus. On October 4, 1902 he was operating the tiller of Hook and Ladder 8 while responding to a two-alarm fire at 142 to 144 Worth Street in Manhattan. The truck struck some planking in the road at the intersection of White and Elm Streets near the quarters of Engine 31 causing the severe jolt that threw Parks from the heavy apparatus. He was taken into quarters and a doctor was summoned. Dr. Rea of Hudson Street Hospital diagnosed a concussion and had Parks taken to the hospital in critical condition. He survived the incident. Fireman Parks was appointed to the Fire Department on February 1, 1900 and assigned to Engine 43 on April 1, 1904. Born on July 19, 1873, he lived at 2548 Hoffman Street in the Bronx. - From "The Last Alarm"
FF Gary Valentino, a 13 year veteran, was assigned to Engine 43 and was detailed as driver for the 7th Division Chief. He died from a heart attack while working a tour of duty. "The University Heights neighborhood of the Bronx is better known for the Bronx Community College and its Hall of Fame. To me, it’s known for the home of 43 Engine and 59 Truck, a place I frequent and consider myself lucky to be associated with. When I first came here in early 2002 during my firehouse tour, I became friends with since retired Fireman Shawn Boland. After hanging out for the day, it was easy to see that this place was squared away. Although quite a few of those guys from then have retired or were promoted, the tradition and the camaraderie amongst the current members is apparent. This is a testament to the dedication that goes into maintaining what this house and this job have: history and a lot of it. The reputation of 43 and 59 precedes them, no matter whom you ask. They are a good mix of predominantly guys with ten years on and a few old timers, who make for an interesting bunch to say the least. At times when I showed up solo or not, the time has always been interesting and down right comical. It is the same circus, just different clowns as they say. I’m always asked, “are you staying for the meal, either way your IN.” This is one reason to never show up empty handed. Their firehouse was built and completed in 1903. The two story red brick structure has an ornate lion’s head medallion in the center of the second floor exterior. The house was built for $35,000. It is located at the corner of Burnside and Sedgwick Avenues, overlooking the Major Deegan Expressway. This house was the design of Arthur Hogan and Vincent Slattery. The two architects, at the time, were well connected politically and had quite a number of civic properties. They are most famous for Manhattan Landmark and the National Registry of Historic Places, the Hall of Records also known as the Surrogate’s Court. That is a seven story structure located at 31 Chambers Street. They also designed two other firehouses for the city during their tenure in the early 1900’s. The University Heights neighborhood dates back to 1894, when New York University’s Bronx campus was built. It was later renamed Bronx Community College, in 1973. The college houses the country’s original Hall of Fame, which is an open air colonnade with bronze busts of 102 of the most influential people in American history. Today the neighborhood population stands at over 42,000. Once the Jerome Avenue elevated train opened in 1917, the once farm community became a home, where the well-to-do had their mansions and villas. It was soon transformed to the present day five and six story h-types with old and new law tenements, along with taxpayers that make up the current landscape. It is also home to Richmond Plaza, a series of 42 story high rises. These are the tallest buildings in the Bronx. From a historical view, University Woods, a small park located between Cedar and Sedgwick Avenues, was used as a fort by British troops during the Revolutionary War. It still contains a pathway with the original stone walls used by the troops. Although not in the same neighborhood but worthwhile, take a walk over to the intersection of the Grand Concourse and 193rd Street to a small park. You will find a small cottage which was the last home of legendary American Writer Edgar Allen Poe. This is a piece of history worth visiting. The number 43 once belonged to the first fireboat to serve the FDNY and was established in April of 1875. It was relocated several times. In 1877, it appeared first at Pier 40 at Pike Street at the East River. It then moved to Pier 1 in 1879 at the foot of Clinton Street at the East River. In 1883, it relocated to Pier 55 at Grand Street at the East River. In 1893, it moved to the foot of East 3rd Street at the East River. Number 43 moved back to Pier 55 in 1894. In 1895, it moved over to the foot of East 5th Street. In 1897 they it returned to Pier 55. In 1898 it moved to the foot of East 96th Street at the Harlem River, where they would remain until being disbanded in October of 1903. They were reorganized as 43 Engine, a land unit on May 1, 1904 at their present location. 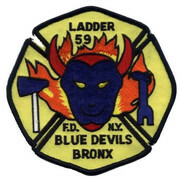 59 Truck is considered a newborn by FDNY standards. It was organized as Tactical Control Unit 712 in 1969 and quartered with 82 and 31. In 1971, they moved in with 85 Engine on Boston Road. They disbanded in 1972 to become 59 Truck and were relocated to 43 Engine in April of 1978. Both companies have several individual medal winners as well as unit citations. 43 Engine had one line duty death in their history. I have to thank Lieutenant Cordaro, Lieutenant Fagan, Pops, Buzzo, the Wahoo, Falesto, TZ, Carmona, Klett, Frace, Tesi, Trahey, Tierney, Donaghy, Ronaldson, Olmstead, Colon, Pagan, Sierra, Walsh, Klammer, Coleman, Kerrigan, Kuhens and all members of 43 and 59, past and present, for accepting me and allowing me to be part of your house. They always treat me like more than just a guest. They are the epitome of class and I will never be able to thank them. And lastly to one of the closest people in my life, Stan Aviles, thank you for being the friend that you are." "On August 21, 1988, the weather was warm and sunny. In the New York City Fire Department (FDNY) in the Bronx, routine tasks were being conducted and Multi-Unit Drills were taking place. At 1748 Jerome Avenue in the Bronx, a single story taxpayer stood at the corner of E. 175 Street. The building was 50 feet x 100 feet. The building contained six stores, four fronting on Jerome Avenue, and two fronting on East 175 Street. In the cellar of this building, there was an illegal social club called “El Hoyo” (aka: “The Cave” or “The Hole”). The only entrance to this illegal club was off of the Jerome Avenue side. There was a stairway approximately 10 feet from the front of the building. The stairway entrance was flush with the floor and the wooden stairway was steep. Inside the club in the cellar, the ceiling was low (7 feet). There were candles burning in the club. There was a bar towards the front of the occupancy. There was no sprinkler system, automatic alarms or fire extinguishers in the social club. There was no emergency lighting. There was a confiscated salad oil bottle filled with gasoline that a patron brought to the club a week before. A Bouncer searched a man attempting to enter the club with the container on his person. The Bouncer found the container, and then ejected the patron. The Bouncer kept the container filled with gasoline. It was being stored behind the bar. At around noon, the club was filled with patrons. There were estimates from the Fire Marshals that there were as many as 150 people in the small club. Loud music was playing. It was a party atmosphere. The salad oil container filled with gasoline was discovered to be knocked over. A barmaid attempted to clean up the spill coming from the container when suddenly, the fluid ignited. The possible ignition source was from one of the candles burning at the bar area. The fire spread quickly and the entire club filled with smoke. The heat and smoke banked down due to the low ceilings. The area where the fire started was near the stairway, the only exit out of the occupancy. Panic ensued as the patrons flooded the exit. The people charged up the steep wooden stairway until the means of egress was no longer passable. The only exit out was being consumed by fire. Many people were able to escape, some could not. The exiting patrons had to climb through the thermal levels. The heat was unbearable as they came closer to the ceiling level. There were eight trapped people. They were trapped in the El Hoyo Social Club inferno. Three of the trapped occupants worked their way to the rear of the social club. They were able to breach a wall that lead to the occupancy to the rear of the club, the cellar of Joe’s Auto Repair. On the floor of the cellar of the auto repair shop were tires, auto parts, and general debris. The three escaping people became overcome with smoke as they attempted to traverse across the cellar floor of Joe’s Auto Repair. Outside, someone ran to the fire alarm box at the corner of Jerome Avenue and West 175 Street. The Bronx Communications Office received ERS (Emergency Reporting System) Box 2935 at 1237 hours. Engine 42, Engine 75, Ladder 33, Ladder 27 and Battalion 19 were dispatched. Captain Michael Giovinazzo was working overtime in Engine 42 for the day tour. As they approached Jerome Avenue from E. 175 Street, he could see a large cloud of smoke in the sky. At 1240 hours, Engine 42 arrived and transmitted a 10-84 and a 10-75. Engine 46 and Engine 43 were dispatched. The Bronx Fire Dispatchers also sent Rescue 3 and Ladder 59 due to numerous phone calls reporting a fire in a social club. These units were sent before Engine 42 arrived. Battalion Chief Michael Towey of Battalion 19 arrived at the fire at 1241 hours. He saw: 1) Many civilians in the street in a frenzy attempting to help the Firefighters as they arrived; 2) Smoke and fire coming out of the crack in the sidewalk between the building and the sidewalk; and 3) A heavy fire condition in the stores at ground level that had extended from the cellar social club occupancy. He called the Bronx Fire Dispatcher and requested ambulances respond for the numerous injured people and the New York Police Department (NYPD) respond for crowd control. At 1244 hours, B.C. Towey transmitted a 2nd alarm. Capt. Giovinazzo of Engine 42 ordered his Firefighters to stretch a 2 ½ inch hand line to the entrance to the El Hoyo Social Club. Fr. Jim Fearon had the nozzle. He had an arduous task of trying to advance the hose line down the stairway to the social club. Capt. Giovinazzo mistakenly thought the stairs had burned away. Engine 42 lied prone on the floor trying to knock down the fire coming out of the stairway opening. commenced forcible entry of roll down gates. They laddered the front of the building and started performing a search of the area above the fire. Ladder 27 was the second to arrive Ladder Company. Captain Richard Jacquin of Ladder 59 was working overtime in Ladder 27 for the day tour. Also working in Ladder 27 was Fr. Tom Murphy, Fr. John Clavin, Fr. Dennis Fennell, Fr. Joe Kisonas and Fr. Jim Forsyth. Fr. Murphy positioned Ladder 27’s apparatus on the exposure 4 (E. 175 St.) side of the building. He raised the aerial ladder to the roof. Captain Jacquin, Fr. Fennell and Fr. Forsyth went towards the entrance to Joe’s Auto Repair shop. There were several civilians frantically trying to raise the roll down gate of the repair shop. The civilian’s efforts jammed the roll down gate. It was stuck and it was only raised 2 feet above the floor. Heavy smoke was coming out of the gate. Captain Jacquin deployed his search rope and he, Fr. Fennell and Fr. Forsyth entered the auto repair shop. The smoke condition was heavy and fire was raging in the cockloft. They made their way toward the rear of the shop. They came upon two large dogs that had succumbed to the smoke. As they made their way deeper into the shop, they found an open stairway. High heat was coming out of the stairway. They descended the stairway, into the rising heat. Half way down the stairway, they found and unconscious man. Captain Jacquin removed him to the outside of the building where he was turned over to EMS personnel that started CPR. Ladder 27’s forcible entry team continued their search for trapped occupants. Captain Jacquin re-entered the cellar where he found Fr. Dennis Fennell with an unconscious female. He helped Fr. Fennell carry the victim up the stairs and over the obstacles deep in the auto repair shop to the street. Fr. Fennell began resuscitation on the female victim. While Ladder 27 was making entry into the auto repair shop, Fr. Ed Marcoux of Ladder 59 used the saw with the metal cutting blade to gain better access to the auto repair shop. Captain Jacquin reentered the cellar for the third time. When he made it down the scorching cellar stairs, he found Fr. Jim Forsyth with an unconscious male. He was struggling to remove him to safety. Both he and Captain Jacquin were able to remove the unconscious man to the street where resuscitation efforts were started. Deputy Chief Tom Moran of Division 7 was dispatched on the 10-75. As he was responding, D.C. Moran requested that an additional Battalion Chief be dispatched to act as a Victim Tracking Coordinator. When he arrived, he was briefed by Battalion Chief Mike Towey of Battalion 19. B.C. Towey was put in charge of the attack on the Jerome Avenue side of the building. Then, at 1249 hours, Deputy Chief Moran transmitted a 3rd Alarm. Deputy Chief Moran decided to employ an alternative attack point. He ordered Ladder 44 to open a sidewalk cellar gate on the exposure 4 side of the building. The El Hoyo occupancy was one occupancy away from the sidewalk cellar gate entrance. Battalion Chief Bill Peterman of Battalion 17 was ordered to supervise this operation. Ladder 44 was being led by Captain Ed Handibolde. Lieutenant Gary Connelly of Engine 92 ordered his firefighters to advance a hose line into the sidewalk cellar gate. The heat was high enough that Lieutenant Connelly feared flashover in the narrow cellar entrance. The alternative attack plan that was being conducted by Engine 92 and Ladder 44 was showing progress. Ladder 44 was able to breach a gypsum block wall which led them to the bar area of the El Hoyo social club. Engine 92 was able to extinguish the fire near the front of the cellar occupancy. building, and Battalion Chief Tom Rappe of Battalion 56 was put in charge of coordinating search efforts from the rear of the building. Unable to advance a hose line into the cellar from the front of the building (Jerome Avenue), Capt. Gallagher of Ladder 33 ordered his members to enter the store over the fire to cut a hole to vent the fire away from the stairway. Fr. John Clarke and Fr. Jack Rafferty of Ladder 33 entered the store above El Hoyo and performed this tactic. Engine 75 moved their back-up hose line into the store to protect these firefighters. Engine 42 was lying on the floor with the hose line trying to get an angle with their hose stream to attempt to cool the cellar ceiling. Engine 92’s hose line was making progress in the cellar. Ladder 33’s forcible entry team made it down the interior stairs and began searching for trapped occupants. Captain Jimmy Gallagher of Ladder 33 found an unconscious male near the bar area. This male was removed up the stairway to the street where CPR was administered. One minute later, another two fire victims were found near the bar area. Another minute passed, and another fire victim was found near the rest rooms. There were now seven victims found and removed from the building. CPR was being administered in the street to these victims. Deputy Chief Tom Moran of Division 7 was now experiencing the nightmare of every Fire Chief; multiple fire victims in an uncontrolled fire. With the initial reports of between 60 to 200 people trapped, Chief Moran transmitted a 4th Alarm at 1312 hours. One minute later, another fire victim was found by the rear bar. This would be the last fire victim of the El Hoyo Social Club. EMS personnel informed Deputy Chief Moran that some of the victims that were removed from the cellar inferno had been declared dead. A make-shift morgue was set up at the gas station. The Rev. Julian Deeken, a Fire Department chaplain, administers last rites to covered bodies at a temporary morgue across the street on E. 175 Street. Six of the eight trapped people would eventually perish. Operating firefighters were physically and emotionally exhausted. Deputy Chief Moran transmitted a 5th Alarm for relief purposes at 1332 hours. The fire was placed “Probably will Hold” at 1352 hours and declared “Under Control” at 1407 hours. FDNY Firefighters were pushed to their limits trying to rescue the poor souls that were trapped in this illegal social club. Ladder 33, Ladder 44, and Engine 92 were awarded Unit Citations. Fr. James Forsyth of Ladder 27 was awarded the “Thomas E. Crimmins Medal”, Fr. 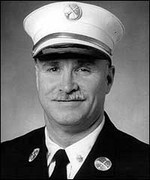 Dennis Fennell of Ladder 27 was awarded the “Walter Scott Medal” and Captain Richard Jacquin of Ladder 59 was awarded the FDNY’s highest medal, the “James Gordon Bennett Medal.”"
The El Hoyo Social Club fire occurred only about two years prior to the Happyland Social Club fire, which took the lives of 87 civilians. After these two fatal fires in these illegal social clubs, the FDNY formed a Special Fire Marshalls Task Force to shut down such operations. There were numerous such operations going on throughout the city and something had to be done. West Farms, Bronx, New York City, New York, U.S.
"The Happy Land fire was an act of arson that killed 87 people trapped in the unlicensed Happy Land social club at 1959 Southern Boulevard in the West Farms section of the Bronx in New York City on March 25, 1990. Most of the victims were young Hondurans celebrating Carnival, many of them part of the Garifuna American community. Unemployed Cuban refugee Julio González, whose former girlfriend was employed at the club, was arrested soon afterward and ultimately convicted of arson and murder. Before the blaze, Happy Land was ordered closed for building code violations during November 1988. Violations included lack of fire exits, alarms or sprinkler system. No follow-up by the fire department was documented. Julio González served three years in prison in Cuba in the 1970s for desertion of the Cuban Army. In 1980, he faked a criminal record as a drug dealer to help him gain passage in the Mariel boatlift.The boatlift landed in Florida; he then traveled to Wisconsin and Arkansas and eventually settled in New York, sponsored by the American Council for Nationalities in Manhattan. Six weeks before the fire, he split up with his girlfriend, Lydia Feliciano. Before that, González had lost his job at a lamp factory in Queens. At the time of the fire, he was two weeks behind on the rent of his room, and the owner of the boarding house where he was staying said of him: "From what I know, he was down to his last hope." The evening of the fire, González had argued with his former girlfriend, Feliciano, who was a coat check girl at the club, urging her to quit. She claimed that she had had enough of him and did not want anything to do with him anymore. He was ejected by the bouncer about 3:00 a.m. local time. He was heard to scream drunken threats, such as that he would "shut this place down." González went to an Amoco gas station, then returned to the establishment with a plastic container with $1.00 worth of gasoline. He spread the fuel at the base of a staircase, the only access into the club, and then ignited the gasoline. Eighty-seven people died in the resulting fire. Nineteen bodies were found downstairs; the others upstairs. Six bodies were found within several feet of the front door.Some of those trapped punched a hole through a wall to an adjoining union hall[clarification needed] in an attempt to escape. Most of the deaths were from asphyxiation or due to having been trampled. Most of the victims were young Hondurans celebrating Carnival, largely drawn from members of the local Garifuna American community.The fire was the deadliest in New York City since the Triangle Shirtwaist Factory fire in 1911, and the deadliest in the United States since the Dupont Plaza Hotel fire in Puerto Rico in 1986. Initial reports indicated that only three persons survived the blaze, but later reports gave the number of survivors as five or six. Among them were Feliciano, the club owner’s wife, and a disc jockey. The disc jockey was hospitalized in guarded condition with second and third-degree burns over half his body. The blaze was extinguished in just five minutes, with 150 firemen having responded."